kksss! But I have a remedy for you my friends. Something for you that you can use so that you NEVER get bored again. I know that is a bold promise. But it is true. I have for you the ultimate list of things to do when you are bored. 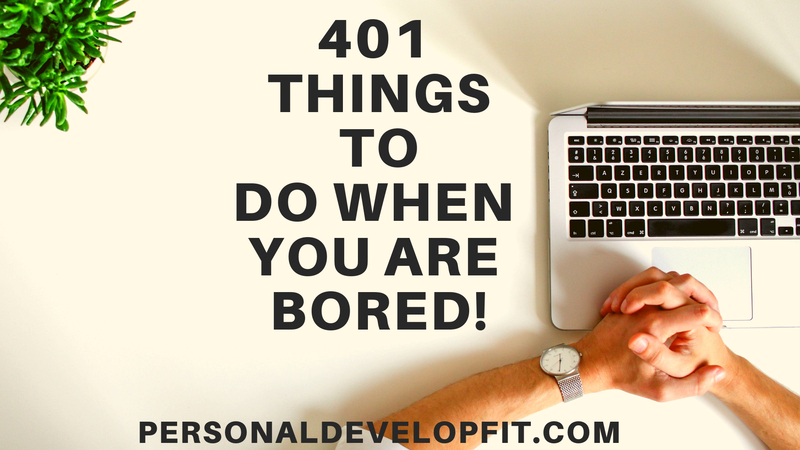 As a matter of fact, 401 things to do when bored. Enjoy my friends. And let me know what tip solved your boredom when your bored self found this article in the comment section below! Read a book or listen to one on audio. Cancel subscriptions your not using anyone to save money. Update your resume, we all lag on this one! Go on a walk somewhere in your city you have never been to explore a bit. Mediate for 10 minutes by watching the breath. Go to the gym or simply do some push ups and sit ups. Go on Youtube and find a good at home workout. Create a budget to monitor your spending. Write down your short term and long term goals. If you need a guide, check out my article: How To Set Goals and Accomplish Them! Visualize your goals, dreams and aspirations. Meal prep your meals for the next couple of days. Stretch for 15 minutes. There are so many great benefits of stretching. Call up a friend or loved one and catch up with them. Take a bath! I mean a little bit of self care can’t hurt! Unsubscribe from email subscriptions that no longer benefit you. Get a recipe online and bake something! Download Duolingo and start learning a new language. Plan your next vacation and look up great places to go while you are there. Rearrange the furniture to switch things up. Do so so that you get your fen shui on point! Start a garden so that you can save money on produce each month. Watch a documentary on Netflix. Create a Pinterest board that represents who you are and what you believe. Or pictures of things you want to do or acquire like cars, houses, clothes and vacations. Teach yourself how to tie a tie. Gents we need to know how to do this! And ladies, there is always a guy out there who needs your help with this! Delete old photos and apps on your phone that you don’t need to free up storage. Get rid of things you don’t use at your house anymore and go donate them to free up space. De-clutter your external environment so your internal environment can benefit too! Write a review online for your favorite product you have bought in the last 6 months. Make some extra money by taking online surveys. Drink a tall glass of water to make sure you are hydrated. Try to style your hair in a new way. Reinvent yourself! Write a poem and even publish it online! Listen to a new genre of music. Try classical, it is great for relaxation! Take a selfie and make a meme with it and send it to your friends for some laughs. Create an Instagram page for your pet. Wash your phone and computer. These puppies get nasty after a while! Shop online for something that can make your life better or more efficient. Research your dream career and make a plan for how you are going to get the ball rolling towards it. Clean up your social media accounts and update it. Clear messages, update profile pictures and delete certain pictures. Clean up an area of your house that you usually avoid. Like the refrigerator or microwave. Take a picture that will become your “before” picture to make you get on the track of transforming your body. Plan on taking another picture 6 months from now and posting it online. Think about the blessings you have in your life. Go fishing and make some fish tacos! Befriend a stranger at a coffee shop. Post and reply in your favorite forum or a forum that is inline with a lifestyle change you want to make. Watch a concert or live performance of your favorite artist on Youtube. Work on forgiving someone that has done you wrong. Not for them, but for you. Skip rocks at a lake. Plan a little house party for the upcoming weekend. Rewatch videos you have shot on your phone. There is always a gem in there of you and your friends that will get you laughing and feeling nostalgic! Write a letter to a public figure you admire and send it out. Watch some skits done by your favorite comedians. Think of ways on how you can save money. Pray for things you want in life or things that you are thankful for. Learn yoga by going through a Youtube tutorial. Find your zen! Learn about a new religion. Go read a coffee shop in town you have never been to. Research other places to live. Learn how to salsa dance, swing dance or even break dance. Learn how to whistle really loud so you can be THAT guy or girl at the ball game. Get up to date on current events. Get a dating app and find your true love! Watch a video from a motivational speaker. Take a bike ride in a part of town you don’t go to often. Introduce yourself to the neighbors. Do some eye strengthening exercises to better your vision. Prevention! Attach a wish to a balloon and let it go up in the air. Make a letter in a bottle and send it out in your nearest body of water. Create a mission statement for your life that you live, sleep and breath. Go eat a meal in the middle of nature. Re-watch your favorite movie or a couple episodes of your favorite show. Learn how to communicate effectively. We can always become better at this which will better every area of our personal and professional life! Go to a group fitness class. Research foundations online that you want to give your time or money to. Start a non-profit for a local or global cause you believe in. Take some pictures and make a photo album out of it. Think of things you can do to get you out of your comfort zone, then go do them! Wash the windows on your house so that you can appreciate the view! Put on a pot of coffee so that you aren’t tempted to go buy one. Sign up on new email lists that will help you become better at things you want to become more proficient at. Invest some money in penny stocks or research good stocks to invest in. Go to a local museum to appreciate some peoples hard work. Create a workout playlist to get you amped during your workout! Take a nap to recharge. Research your family tree online to see if you are related to anyone famous. Update your email signature that looks more professional with your new title and contact information. Delete text message threads that you no longer are a part of. Run an update on your phone and computer. Join a group in your area that will help you build more professional connections. Research networking opportunities or download a networking app on your phone like Bumple Buxx. Create one new positive habit and create a plan for you to live by it for the next month so that it becomes ingrained. Watch a TED talk to give you some new perspective. Contact someone about being mentored in an area you want to get better at. Create a list of reasons why you deserve a raise, then ask for it. Follow positive people on social media that will give you daily inspiration. Update your social media profiles that reflects your new job, new perspectives, where you live, etc. Make a to-do list and start doing the things on the list. Learn time management tips that will help you maximize your 24 hours. Learn more about your current religion and how you can better practice it in your daily life. Find things in your house that you can sell and list them online. Or plan out a garage sale with them. Prank call one of your buddies LOL! Learn how to sing better, learning what type of singing voice you have and learning how to sing better with it, so that you can rock karoke night. Look up world records and admire some of the weirdest and coolest records ever broken. And find one that you can break! Learn calligraphy so you can create more personal hand written notes. Send out some thank you notes to people who deserve it. Perfect a couple jokes so you have them in your repertoire. Go mini or regular golfing. Facetime with a buddy in another town. Play catch with someone or throw up a ball in the air and catch in your hand or in your glove. Build a massive fort in your living room. Learn the lyrics to a song that you mostly know, but always wondered what the lyrics were of the parts that you mouthed to or sang them but didn’t know. Think of ways that you can create a side hustle with the skills that you have. Get to know your town more by getting a map of it and exploring it or learn about it’s history. Think about your life and if you are truly living your passion, if not create a plan on how to do so. Because life is too damn short not to be. Tell yourself that you love yourself 100 times. There is no better way to boost your self esteem! Go shoot guns at a gun range. Clean out your car and wash it. Look up in the sky and try to spot animals or faces in the clouds. Paint a copy of a picture you have taken on your phone. Draw a picture or color in an adult coloring book! Create a time capsule and bury that bad boy! Flex in the mirror like you are Rocky. Buy some good supplements off of Amazon that can contribute to better health. Speed walk around the block. Clear out un-listened to messages in your voicemail inbox. Go to 7-11 and buy 10 dollars worth of scratchers. Look on Craigslist for bargain deals that you can flip and sell for more. Create a new bank account that allows you to save for things like retirement or to spend on fun things for yourself. Look at your old year books. Clip your fingernails and toenails. Do something you have been procrastinating on. Write a book or create a movie script. Build some paper airplanes and see how far you can fly them. Try to keep breaking your record. Plan out a friend or family members birthday. Make some contacts with professionals in your area by reaching out and email or texting them. Clean out your kitchen cupboards. Learn how to knit something then knit a sweater for a family member. Pick up some trash in your neighborhood. Go play with pets at a pet store. Learn how to become a better listener with my article HERE. So you can show people how much you care and empathize with the people in your life. Research some conspiracy theories and get your mind blown! Go to your old junior high or high school and see if any teachers you used to have are still there and drop in and say hi! Go bungee jumping or skydiving! Face your fears! Create a list of your favorite quotes to keep on you when you need them. Read autobiographies of your favorite people in this life. Try to learn an accent. Get a manicure or pedicure. For dudes shaking their head, it is pretty awesome, trust me! Take a drive and listen to music super loud. Make a list of the things you love most about one or both of your parents and send it to them. This will make their LIFE! Delete your subscription to something that takes up a lot of your time that you could be using more effectively. Look back on the past and track all the things that got you to where you are to show you that everything happens for a reason. Go visit your mom or a close family member that lives near you. Drop in on a buddy at work and surprise them with lunch. Drink a beer while sitting at the beach AHHHHH! Shop online for clothes you wouldn’t normally where to add versatility to your wardrobe. Draw funny faces and hair on your old yearbook photos or in the newspaper or magazines. Get some food you don’t normally eat to get you out of your comfort zone. Massage yourself or go get a massage. Try to do a one handed push-up to channel your inner Bruce Lee. Look up quotes from your favorite artists or celebrities. Go sneak into a hotel with a hot tub and soak it out! Replace a limiting belief with a empowering belief. Tell someone close to you that you love them. Dance around the house as if no one is watching, well because they aren’t! Create a “How To” video on Youtube in your area of expertise. Make sushi at your house. Train your dog or cat to do a new trick. Put on some white noise and just chill out, let yourself recharge. Work on your car like changing the oil or replacing things like the windshield wipers. Go kick field goals at a football field. Enter yourself into a 5K race. Throw a frisbee or football around with a buddy. Do some wind sprints or run up and down the steps of the bleachers of the local high school. Get your sweat on! Track your calories that you had for that day to keep yourself in check for your diet. Hire someone to do something you don’t want to do. Like on Craigslist for a gardener. Or on Fiverr.com to make a new logo for your business. Watch something with Will Ferrell in it. The guy is a riot. Research comedy shows in your area and buy tickets for you and a friend. Walk to do some chores instead of driving, mixing productivity with fitness. Wear your heart on your sleeve by reaching out to a person that you want to ask out but haven’t. Admit a fault to yourself. This is a great way to fix bad habits by becoming aware of them and then changing! Buy some motivational posters online so you can place them around your house or in your office. Go test drive a car. Go try on clothes that are way too out of your price range but can make you feel like luxury. Go sit by a river and just listen to the sound of the stream and nature around you. Build better relationships with your spouse and/or kids by having a family meeting about how you can help them achieve their goals. Go to a roller skating rink. Go to a park and look for a four leaf clover. Design a tattoo for you to get. Look at ways you can save money on your electric bill or any bill for that matter. Make a pizza yourself and cook that bad boy up. Get some sidewalk chalk and draw out some of your best stick figures. Get a mini rocket and launch it at the park. Reenact an old photo of you and a sibling from when you are young, and send it to your parents. List the ten qualities about yourself that you are most proud of. Make a list of the things you want to get better at for personal and professional purposes and then start taking steps towards doing so. Grab a ladder and go sit on the roof and chill out, overlooking your town. Laugh at super old pictures of yourself. Buy a set of dumbbells on Amazon and get them shipped to your house so that you can start doing at home workouts. No excuses! Read a book or take a course in your field to make you more marketable and to make your resume look better. Create an herb kitchen garden. Re-arrange all your books in alphabetical order. Vent about something on video to blow some steam off. Create a good list of excuses about why you can’t come into work! Scare the crap out of one of your friends. Practice creating the perfect hand written signature. Make some hot chocolate and swig that baby back. Join an online discussion group and chime in. Light up a fire and read a book by it. Read some online comic strips. Tie a knot with a cherry stem using only your mouth. Learn some good survival skills on Youtube. Start a coin or stamp collection. Register your name to vote. Read about upcoming local candidates to vote for. Think about the top 10 best memories of your life. Go test out mattresses at the mattress store. Shop for deals on Craigslist for things you need. Watch a movie with subtitles. Research random words on Urban Dictionary. Buy a punching bad or speed bag and get some self defense mixed with some cardio! Go to the library and check out some good books or TV shows. Stop by your City Hall and get in the know about the events going on in your town through the community calendar. Learn how to change the oil on your car by watching someone do so on a Youtube tutorial. Go to your local museum. Join a fantasy sports team. Go for a nice long hike. Look at a bunch of funny memes. Think about the top 5 qualities you want to be remembered by and then start brainstorming on how you can become that person day in and day out. Jump in the air and click your heels. Organize a block party where everyone brings their own food and beer. Figure out what your net worth is. Create a compost bin where you put all your natural waste in like coffee grounds, egg shells and vegetables in. Then put all of it’s contents in your own garden. Put on a yard sale. Clean out your desk and create files for everything, getting yourself organized! Go swimming at a local swimming pool, in a lake, at a gym pool or in the ocean if you live near it. Go treat yourself to a massage. Go to Buzzsumo and find out what the most popular pages on your favorite blog are site are, then go read some of them. Do a natal chart or read more about your zodiac sign and read your horoscope for that day, month and year! Create good answers to some of the most asked job interview questions. Quit your job and pursue your passion. Go slide down a slide or swing on the monkey bars. Learn to do an impression of your favorite celebrity. Research new hairstyles to try out next time you go to the barber or hair stylist. Come up with new outfit combinations for the next week so you avoid decision fatigue and don’t have to think about it when you wake up. Have some passionate and intense love making with your significant other. Go to the thrift shop and get some deals on some fresh clothes! Think about what you are going to be for Halloween this year. Login to your banking app and make sure all the transactions have been done by you and there are no fraudulent charges. Create a list of things you are grateful for. Do some karaoke at home. Charge up all your electronic devices. Drive somewhere with an awesome view, park and then put on some good music or a podcast. Write a story about all the bad things that have happened to you, then burn it, allowing you to let go of the past. Learn some fun and interesting facts. Create your own beer at home. Go to a steam or sauna and sweat it out. Make an immune boosting smoothie. Go cash some change at coin star. Go check out hidden spots in your area by searching for “Hidden spots in X town”. Check out the best photos of the day on National Geographic. Change the background on your phone and computer with something like a motivational quote or your dream house. Add pictures of your friends to their contact in your phone so that their picture shows up when you call. Go shoot targets with a BB gun. Buy some scented candles and light them up all over your place. Do facial exercises that can help tone and tighten your face. Do some tongue twisters so that you can speak more eloquently. Reach out to a friend and see if they want to be accountability partners for your twos goals. Have accountability for your goals can increase the chance of the attainment of that goal by over 90 percent! Pay some bills off so that you have peace of mind. Or put bills on auto-pay so that they are always getting paid right on itme. Learn the anatomy of the body. Look up good kids names if you are wanting to have a kid one day. Or look or good dog names if you are looking to get a new dog soon. Look up the best financial advice of all time to get you ahead in life financially. Melt a kids heart by making them laugh at a funny kid joke. Twiddle your thumbs. The ultimate thing to do when you are bored! Pray for guidance in your life. Scratch yourself with a back scratcher. Jump rope like your a fighter! Make your own music online. Make a candle at home. Create something out of papermache. Have an egg and spoon race. Buy a fart machine and prank people in public LOL. Throw a ball against a wall. Go on a scavenger hunt with some friends. Make up your own dance. Go get frozen yogurt or ice cream. Go play at the arcade and beat a high score on pinball. Go to a water park. Go to the flea market and/or sell something at the flea market. Build something epic with legos. Do a few hand stands. Learn how to make a clover with your tongue. Fake laugh until you are full on laughing for real. Climb a tree and while you are up there, build a tree house! Write a song or rap. Edit some of your photos on your phone. Create a motivational quote of your own on Canva, quote yourself, and publish it online. Get that baby circulating! Browse IMDB to see what other movies your favorite celebrity has been in that you may not have known. Then watch one of them! Check on your favorite sports teams and see how they are doing this year. Go walk through a shopping mall. Pull up some tropical pictures online and pretend like you are there! Think of a creative license plate that you can customize for your ride, then order it! Research the net worth of your favorite celebrities. Scroll through Personaldevelopfit.com for some more bomb articles! Make some slow motion videos with the videos you have taken of you and your friends. Buy some new music on Itunes. Spy on your neighbors like you are in the movie Disturbia! You never know what weirdness the “normal” people may be up to! Shoot some hoops at the park. Reach out to a friend for good new band recommendations. Watch a sports game on TV. Look at a map of your neighborhood. Carve yours or yours and your significant others initials in a tree. Give money to a homeless person or make them food to give to them. Make water dropping noises with your mouth. Ask Siri 10 random questions. Watch some of the past Olympics on Youtube to get inspired by the greatest athletes of all time. Look at pictures of the planets and solar systems. So there we are my friends, the best things to do when you are bored. I really hope you found a cure for your boredom within this massive list. Share with me what helped you most on your journey out of the world of boredom in the comment section below. As well as if you have any good tips to add! The goal was to provide way more boredom quotes, but being purely honest, I got bored creating this list. 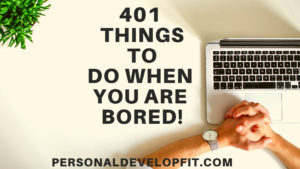 But there are 20 quotes about being bored for you if you are THAT bored! “I’m bored is a useless thing to day. I mean you live in a great, big vast world that you’ve seen none percent of. Even the inside of your mind is endless. It goes on forever, inwardly, do you understand? The fact that your alive is amazing, so you don’t get to say ‘I’m bored’.” – Louis C.K.